But I soon learned that Michigan’s 11th District, and the Detroit Metro Region, is rich in heart, soul, and foods with heritage, foods with handmade character, foods that have become working America’s traditions, like the Greek Island Coney in Birmingham. My husband, daughter, and I had driven 15 hours from Massachusetts when we arrived in Novi that rainy night; Nicie and I were combining this district visit with dropping my daughter off for her sophomore year at the University of Michigan. Nicie flew in the next day, and we started our tour of Michigan’s 11th. For the next few days we drove through neighborhood after neighborhood of 20th century homes shaded in older trees and summer-bold gardens, bikes dropped in driveways, basketball hoops, neighborhoods built by the auto industry. In Northville we interviewed candidate Fayrouz Saad. After our hour-long conversation, we asked her our lunch question - where should we go? Saad had just finished discussing her work as the Director of Detroit’s Immigrant Affairs, but she proved she speaks government policy and avocado toast, recommending all the best hip places nearby. Even better, Ms. Saad paused and said, “you want Lebanese food?” And just like that we were headed to Al Ameer, the only Arab American Restaurant to win a James Beard Award. The Greater Detroit area is home to one of the largest, oldest and most diverse Arab American communities in the United States. While Dearborn is not in Michigan’s 11th Congressional District, we can’t not talk about Al Ameer, or Shatila, the bakery of Lebanese riches with stores in both Dearborn and Bloomfield. 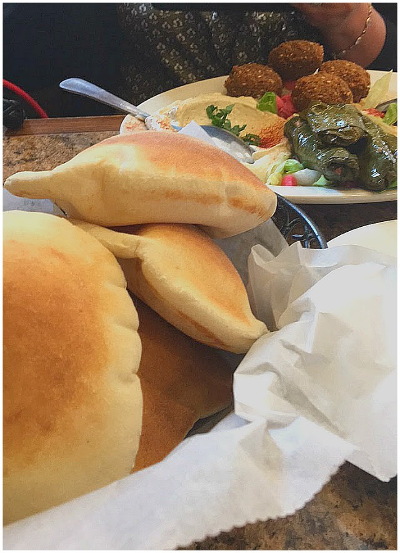 At Al Ameer we had a luxurious lunch of Lebanese classics - falafel, stuffed grape leaves, fava beans, hummus and warm loaves of pita, each dish artfully seasoned and presented. This is not simply Lebanese cuisine; this is the standard by which one should measure all Lebanese cuisine. At Shatila we purchased trays of Lebanese pastries - including Knefeh, layers of flaky pastry filled with a sweetened cheese - all glazed in rosewater syrup - to take to our potluck dinner. The route from Novi to Birmingham, MI is strewn with small lakes, as if the glacier skidded, rutted out its path, and the hundreds of ruts filled with water. Lake cabins and lake houses cluster along the edges. When we arrived at candidate Stevens’ home for an interview, a deer, beneath an enormous old apple tree, lifted its head from a trove of drops to say, “hey,” and then went right back to dining, not caring one bit about car doors closing and gear unpacking. Haley Stevens was prepared. She started the interview by telling us about the Greek Island Coney. This was Stevens’ dad’s favorite lunch. The Coney, she said, is quintessential Detroit Metro food, a hotdog with ground beef on top, cheese and onions. Or, it’s a hotdog with ground beef, CHILI, cheese, and onions. Of course, Stevens, who helped run the Obama Administration Auto Rescue, had a lot to say about the promise of advanced manufacturing in the district, and the challenges auto and government face with self-driving cars on the road. (What happens to the insurance industry?- Stevens asks.) She grew up here, practically beside a Ford assembly line, and has a firm finger on the pulse of this district, including knowing the most popular lunch. I checked out the Greek Islands Menu, and believe the Avgolemono (Greek rice and lemon soup) and Spinach Pie Platter promise as much as that Coney. When we’re counting votes district lines matter. When we are looking for a great dinner or the source of a good recipe, when we’re looking at a community’s history, or the shaping of a culture, those district lines dissolve. Which is why we just had to visit Detroit. Detroit’s renaissance under Mayor Mike Duggan is bold and purposeful. Although some are already anticipating the city will have that all too common gentrified center, we believe Duggan’s mission is to raise the whole city. Saad’s work with small immigrant businesses in Detroit is just one example of Duggan’s commitment. Go see what’s going on here. The Detroit Foundation Hotel, the former Detroit Fire Station, seems like homebase for the Renaissance. An Adam-style, neo-classical beauty of a fire station has been transformed into a grand marriage of vintage and cutting edge. The podcast studio, where we interviewed Jim Hayes, is furnished in 1930’s era wooden swivel chairs. In our MI11 podcast we talk about the Buckets and Bubbles at the Detroit restaurant Gold Cash Gold. But we didn’t have time to talk about Johnny Noodle King, a recommendation from Jim Hayes. Johnny Noodle King is the olympics of noodles and broth: Japanese, Korean, and Vietnamese. Pho, Ramen, Shoyu, and Pad Si U (sic). The noodles and broth are made in the kitchen, as is the brilliant imagination that creates the bowls, like Smoked Butter Noodles: smoked butter, mustard greens, onion, Ramen noodles, and Korean chili powder. We have to give one more heavy bow to all the people who helped create our potluck dinner in Bloomfield Hills, particularly to Margaret and Brad Baxter who hosted. About twelve of us sat in the Baxter’s backyard, after serving ourselves from a kitchen table covered in contributions: Michigan Chicken Salad (with dried cherries), spicy tomato and chickpeas, barbecue chicken breasts, a Michigan green salad (with dried cherries) sliced apples, goat cheese, and pecans, and Margaret’s potato salad, just to name a few. Dining in the Detroit Metro Region never once failed us. Although that first flush of fast food restaurants would have served a purpose of convenience, we found inventive, authentic, great food at every meal. Here’s what we’re learning: if you’re hungry in America, find out who is running for Congress; they have the best tips. Mix together bulgur, spice, tomato paste, and lemon juice. Let sit for 10 minutes. Assemble the remaining ingredients- except the salt and oil - in a large bowl. Add the bulgur mixture and mix well. Add the salt and oil, and toss again. Allow the salad to sit for at least 2 hours, so that the flavors meld and the bulgur softens. Before serving, taste for salt and lemon juice, adding more if necessary.